An anti-virus program for the advanced user and ESET NOD 32 will make sure that virus is prohibited on your PC! Your antivirus program has one job: being able to clean out malware infections on your system and preventing more people from sneaking into your system. Many common antivirus programs remain faithful to this philosophy, but others like ESET NOD32 antivirus take that extra step and give you even more protection. ESET NOD32 goes all the way down to the detail to make sure your system is running as it should. With efficient treatment and exquisite precision, most viruses on your system will have the death blow you have been trying to give them long. A subscription to ESET NOD32 costs NOK 304 annually, but the free basic package is effective enough in itself to handle most tasks. ESET NOD32 does not offer, like so many other virus programs, a quick scan, but only the in-depth and full version. Why? 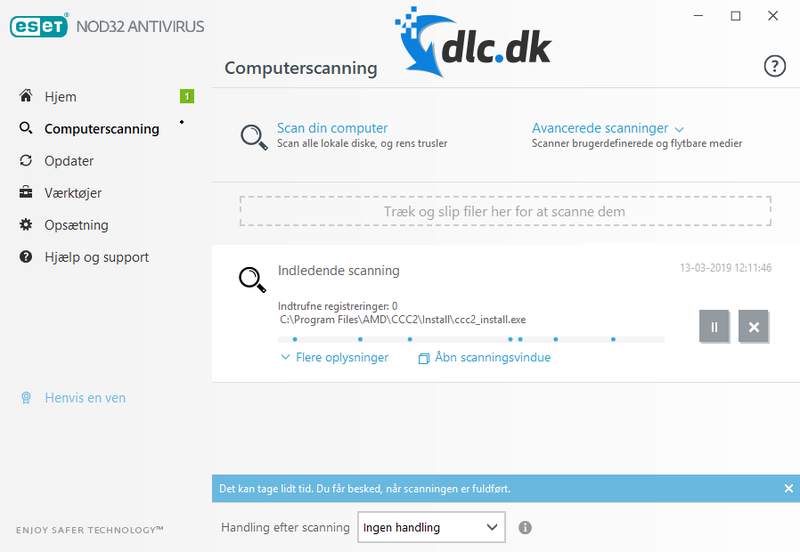 Quick scans typically do not capture the hard-boiled viruses on your system. By using the in-depth scan, you really keep yourself safe and thoroughly cleaned up on your system. However, ESET NOD32 antivirus scans slower than most other antivirus programs we have tried, and therefore at least one and a half hours should be set for the first scans. ESET NOD32 Antivirus is an antivirus program that adapts to the road. Using data from previous scans, the program remembers which programs are already secure and does not present a threat to your system. This way, your scans are optimized slowly but surely. 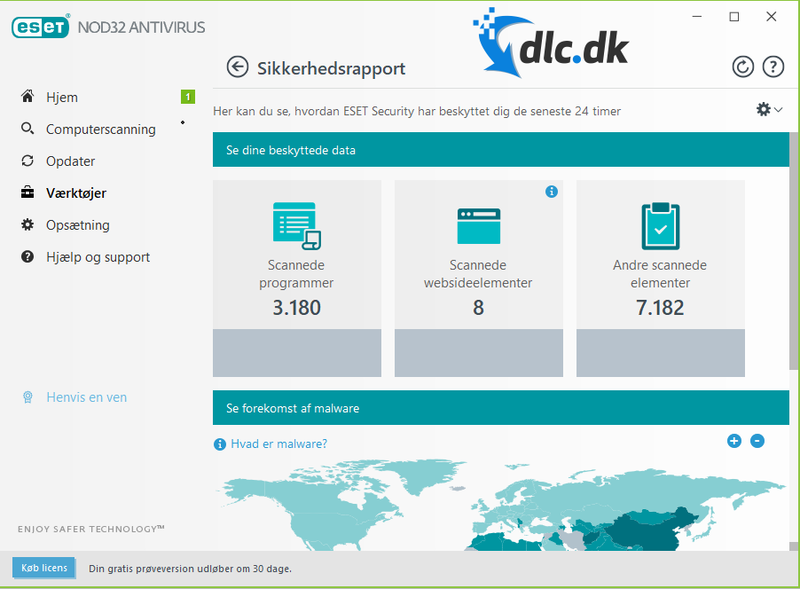 Besides being able to scan your system, ESET NOD32 Antivirus can also scan other devices that you have connected to your system. It can be an external hard drive, your phone, etc. In this way, the program's protection goes far beyond all your devices. What makes ESET NOD32 Antivirus one of the most effective anti-virus software on the market is its enhanced selection of security tools that add more layers to your security. Such a tool is, for example, the security report. The program's security report provides you with a wide variety of statistics showing what the program has been running in. These include internet sites and programs that it has scanned and what it has found there. Besides that, the report also shows you the general virus situation in the world. You will be provided with a map where you can see where most threats come from. Besides this, ESET NOD32 Antivirus also has a process list that in short works in the same way as your system's job list: it shows you information about running processes on your system. But it does a lot more than your job list. For example, it gives you an insight into when specific programs have behaved strangely and logs the information. ESET NOD32 Antivirus is a program for those who would like to have some control and influence on virus control in your system. With its many extra features, you get the opportunity to familiarize yourself with your system's state, and then choose which steps you want to take to solve any problems. Therefore, the program is mainly aimed at people who have slightly more computer knowledge than the normal person. But don't be mistaken, the program runs great without your interference, and is a good choice for everyone if you are technically knowledgeable or not. The uniqueness of ESET NOD32 Antivirus is its openness. Transparency understood in the sense that you as a user have a lot to have said about what the program is doing. Is there a program, dIf you smoke in the trap of the program, you can choose whether to stop it or if you want to run it yourself. With the many graphs and statistics that map your system's health, you can also actively step in and make the difference you think is appropriate. 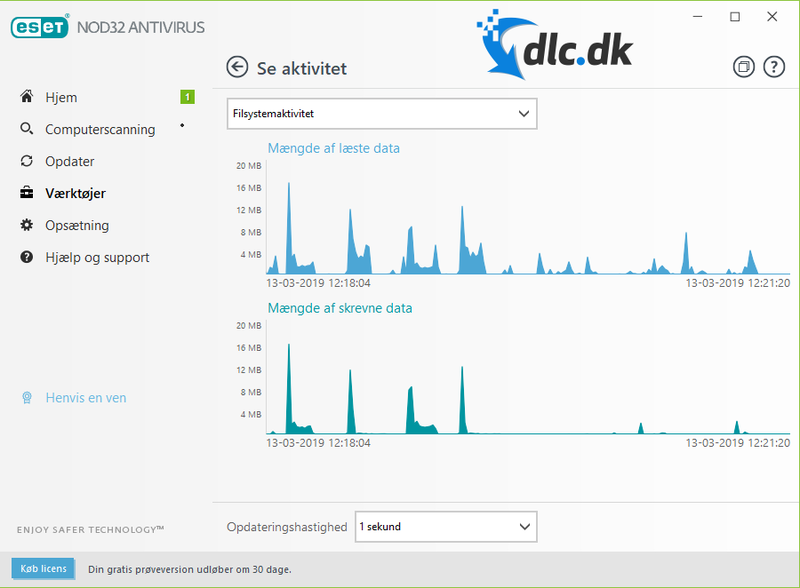 The vast majority of antivirus programs today come with a very user-friendly design. This is, of course, due to the fact that the manufacturer is well aware of the fact that most people who use an antivirus program, or are required to do so, are not necessarily the largest computer sharks. Therefore, the program should preferably be able to explain itself and be obvious. This is also shameful with ESET NOD32 Antivirus. The program provides you with a ready-to-use interface. You will not be confused by complicated functions; everything is explained simply and easily. There is also the option of searching for features in the program if there is something specific you are looking for. Therefore it is incredibly easy to get started without the great experience. If ESET NOD32 Antivirus still seems too intimidating, you can always try another less complicated but highly effective antivirus program. Such a program is, for example, AVG Antivirus Free. AVG Antivirus Free provides you with the most features you will need, and it is even free. AVG Antivirus Free can be downloaded for free here . ESET NOD32 Antivirus is an effective but easier-to-use antivirus program to use. If you are already familiar with the technique, you can get a lot from the program, and it is clearly aimed at the type of people. But in any case, it is still one of the most effective and highly respected anti-virus programs on the market. It can only be recommended. Find ESET NOD 32, mark it and choose "Uninstall"
Should ESET NOD 32 has been damaged or corrupted and thereby difficult to remove we can recommend you finding help to uninstall it here.